This incredible wedding opened up proceedings for the 2017 wedding season... and what a way to start! 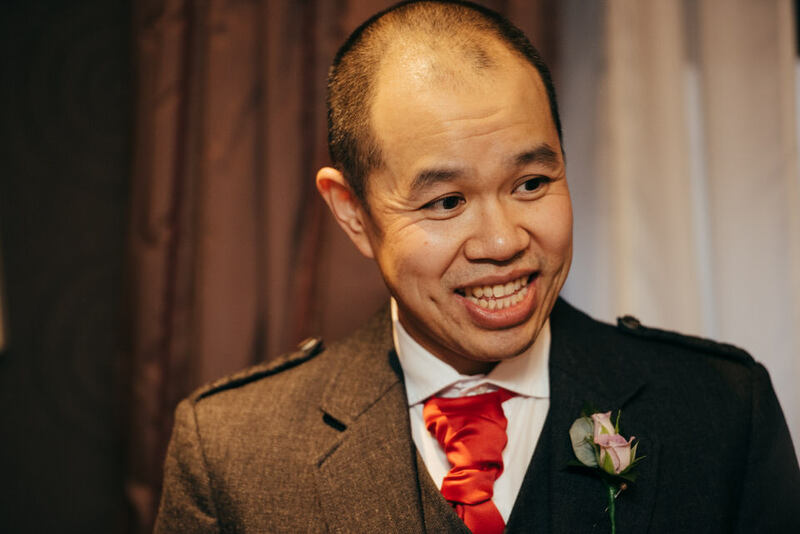 Joyce and Steven had not one, not two, not even three, but FOUR venues for this epic Chinese wedding in Glasgow. The same went for the dresses as Joyce had a new outfit for each event... and every dress was just as beautiful as the other. Steven only had one outfit - surely that isn't fair! The hair and make-up started at 04:30am. Yes, 04:30am. My amazing second shooter Martin Venherm and I started at 06:30am and somehow managed to keep a high level of energy all the way through to around 23:00 at the evening reception. I think that we were driven by the high level of energy and infectious laughter that was had by everyone throughout this superb day. The morning preparations and the Chinese tea ceremony took place at Hotel Du Vin, Glasgow, the wedding ceremony was at Cottiers Theatre, Glasgow, the Chinese wedding banquet was enjoyed at Chinatown Restaurant, Glasgow and finally, the evening reception/dance-a-thon rocked out at The Corinthian, Glasgow. As a quick side note, thank you to the guys at Partickhill Bowling Club for allowing us to use their recently renovated facilities to capture some beautiful portraits.